Than the glisten on the aubergine? To that gleam upon purple skin? Will always lift you when you're low. Just gaze upon its pure brightness. The sparkle of a fine eggplant? Is the pinnacle of pomposity. Are sufficient for its glaze. Pray lift me with your light. My life's a crock of shite. With that brilliant shining glare? You'll never see a thing so shiny. The eggplant's sheen beats any star's twinkle. 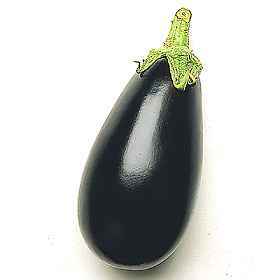 In celebration of the aubergine's brilliance. Look a pile of toss. How I admire your glitter. And stick them up your shitter. The finest on the planet. OK, you're right, I'll can it.